← December 25, 2011 Happy Holidays ! 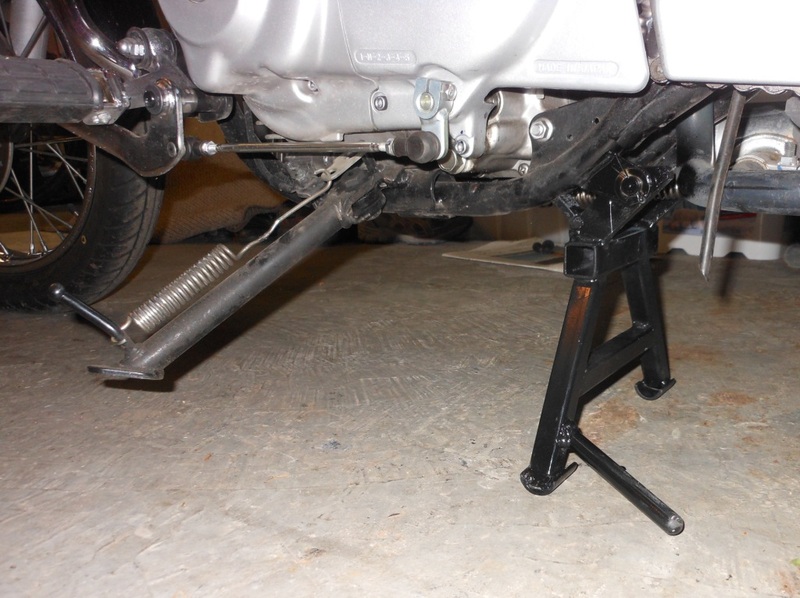 I added a SWM centerstand that is made for the European model V-Star XVS125 and XVS250. It is not an exact fit, so it was a little difficult to install and it does not work perfectly like a factory centerstand should, but it is fine if you are not fussy. I tried different springs (that hold it up against the frame when not in use), but I could not get it to hold the centerstand up, so I added a magnet. I used construction adhesive to attach it, and it has stayed on for over six months. The center stand is mounted a little more forward than normal, so when I need the rear tire to be off the ground, I have to hang some weights on the front wheel. My footpegs are moved back; weight distribution would be better with the footpegs in the original position. I do not trust or use sidestands so I removed the sidestand. I saw a guy on a Suzuki 750 WB go down on the highway because his sidestand was down. I also saw a mint Harley fall over because the sidestand was not all the way out. Sidestands cause a lot more trouble than centerstands. From the 1960’s until about 20 years ago, bikes came with centerstands, and sidestands were optional – now things are opposite. The sidestand weighs 1.5 lbs and the centerstand that I added weighs 4.3 lbs. 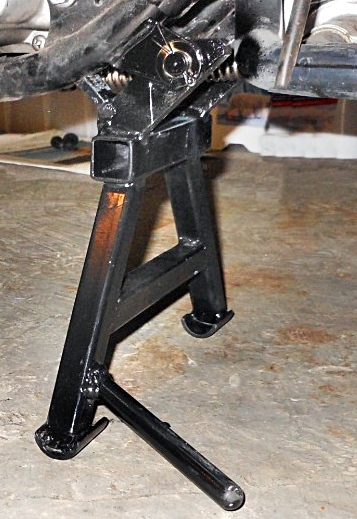 Thanks to Darren from Australia for asking about adding the centerstand. The posting below is from Yves Petit of Canada. I have not seen his center-stand, but it seems to be very well made and is probably much more stable than the center-stand that I have. I bought my V-Star 2012 this summer and to my great disapointment, I realized once home that it had no centerstand. All my previous bikes had centerstands. I was sure Yamaha offered it as an option but no…not available. After reading what Les had to say about the SWM centerstand, I set out to design one. I have it on since one week and it does the job. I recently changed the drive sprockets (see other post http://wp.me/p1LWaM-13 ) and I don’t know how I could have taken the rear wheel off without a centerstand! 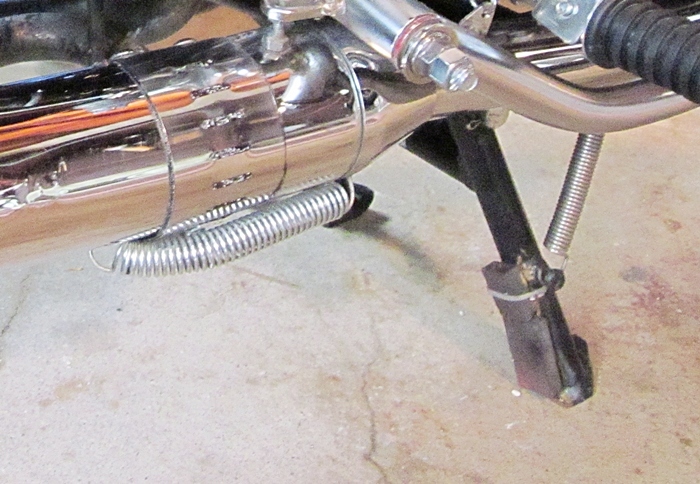 The centerstand attaches to the existing “ears” which I suppose are remmants of the the former Yamaha centerstand. The spring atttaches to the flat bar that links the two tubes of the cradle underneath the bike. See photos below. I can have some manufactured and shipped to those who would like to have one. Sunil, who posted previously and I are surely not the only ones for whom a centerstand is essential. My price is $200 complete with spring, pivot pins and excluding shipping. Let me know and we can work out the payment. Today’s random thought – When in traffic, pay the most attention to the cars slightly ahead of you that could cause you a problem – most of the time, you will get some sort of clue (early warning) that they are going to pull in front of you. If you speed up and pass the cars, continue to watch the cars when they are beside you, as they still are a threat to you. Peripheral vision (side vision) is extremely important to motorcyclists, especially if you ride in heavy traffic. This entry was posted in Motorcycles and tagged Sidestand danger, Virago 250 adding center-stand, Virago 250 center-stand, Virago 250 modifications, Virago 250 mods, Virago 250 updates. Bookmark the permalink. What adjustments have you made ​​to mount the stand ? 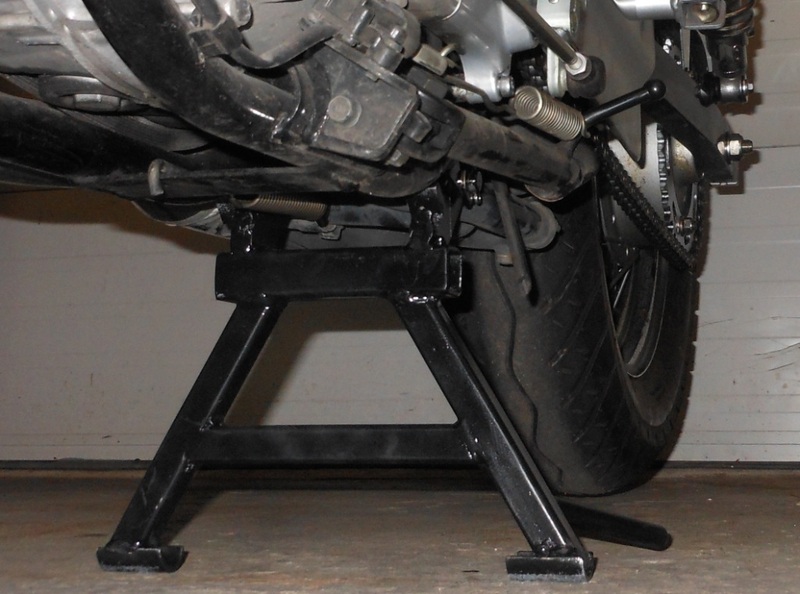 Since the SWM centerstand that I bought was made for the European model V-Star XVS125 and XVS250, it does not fit very well – I tried several different mounting methods and finally it was good enough, but definitely not a great fit. I bolted it to the crossbrace under the engine. I had to drill a few holes in the crossbrace to bolt the centerstand to. I tried different springs (that hold it up against the frame when not in use), but I could not get it to hold the centerstand up, so I added a magnet. I attached it with construction adhesive, and it has stayed on for over a year. 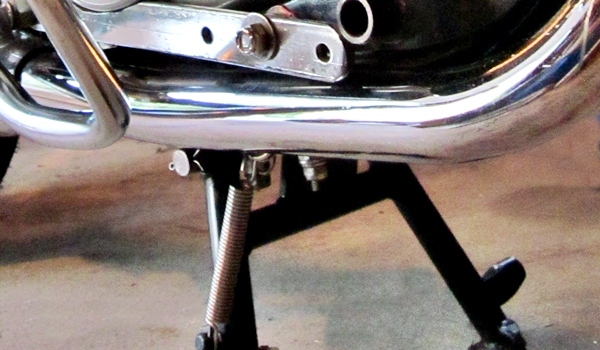 I want to fix a centre stand to my Yamaha 250cc Cruiser, pls give me some good solid ideas pleeeez…????? 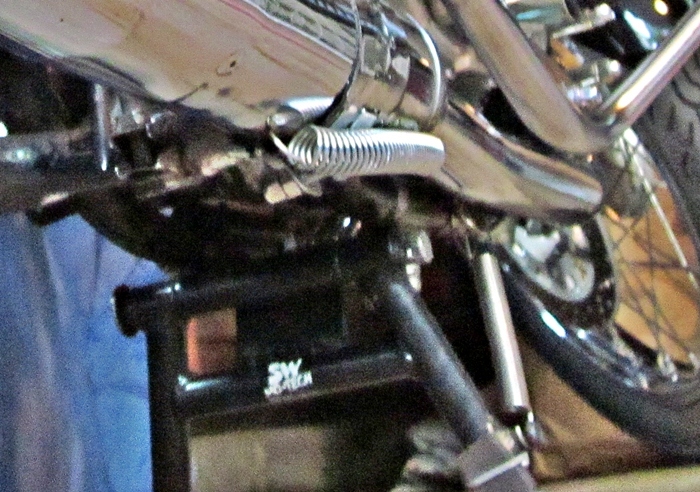 SWM makes a center stand for the European model Yamaha V-Star XVS125 and XVS250, but I think they no longer make a center stand for a Virago 250. For notes on installation, please the posting “Adding a centerstand to a Virago 250” and the comments. I recently changed the drive sprockets (see other post) and I don’t know how I could have taken the rear wheel off without a centerstand! Thanks for sending this. Your center-stand looks very sturdy and stable. Does the spring (that raises the stand when not in use) raise the stand all by itself ? – or do you have to help lift it by hand ? The spring is amply strong to lift it up and maintain it in place without movement. I use a piece of cork taped to the centerstand to absorb the schock when the stand hits the contact point which is the rear cylinder exhaust pipe. Springs are a tough mechanical component to select but during engineering life I have selected many springs and I know where to look to find the right one. My centerstand was recently installed to 1996 and 2005 Viragos. So now I know that this centerstand can fit all viragos from 1996 to 2012. If you wish to have the contact info for these buyers, don’t hesitate to contact me. Hi travelbug, drop me a word on my email (yp251@yahoo.ca) and I can send you comments from other buyers. I just sold one for a 2008 model.